Batman vs. Superman Batmobile 1:18 Scale Hot Wheels Vehicle:Ever wanted to own Batman's ride? Well now you can with this Batman vs. Superman Batmobile 1:18 Scale Hot Wheels Elite Die-Cast Vehicle. This Batmobile is a replica of the Caped Crusader's ride in theBatman vs. Supermanmovie and is replicated in highly detailed die-cast at 1:18 scale. The Batman vs. Superman Batmobile Hot Wheels Elite Vehicle features opening doors, trunk, and hood to reveal a detailed interior and engine. 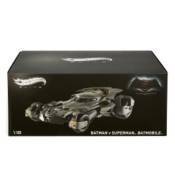 The packaging will feature aBatman vs. Supermantheme and the Batmobile will be secured in polyfoam in a closed black box.